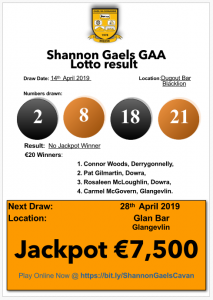 Draw 20th January 2019 in “Maguires Bar”, Blacklion. Numbers drawn were 5, 7, 15 & 21. €20 winners: Cathal Diamond – Drumahair, Terry McGovern – Belcoo, Kayln McGovern – Kildare & Sean Greene – Blacklion. Thank you to all those who came to our A.G.M. on Saturday 12th January and for showing an interest in the running of the Club. Club Officers are Chairperson Philip Feeley, Secretary Michael Lee, PRO Ronan McManus, Insurance Officer Jason McLoughlin, Coach Oliver Nolan and Michael Lee. Thursday the 24th January 2019 at 9pm in the club house.